Baltimore beat up on CC Sabathia, Ken Griffey Jr. homered in his return to the Seattle Mariners and Emilio Bonifacio became the first player in 41 years to hit an inside-the-park home run on opening day. Following a winter of worry about whether the recession would damage attendance, major league baseball returned across the nation Monday. Atlanta beat World Series champion Philadelphia 4-1 on Sunday night and 26 more teams had been slated to open Monday before bad weather caused a pair of postponements: Tampa Bay at Boston and Kansas City at Chicago. They’ll now get going today, when Milwaukee and the Giants were scheduled to meet in San Francisco in the last of the 15 openers. Even with economic worries, most openers were sold out despite some chilly conditions. At Camden Yards, Baltimore took advantage of a wobbly Yankees debut by Sabathia, whose $161 million, seven-year con- tract is the richest for a pitcher. Sabathia allowed six runs, eight hits and five walks in 41/3 innings. He threw two wild pitches and failed to strike out any batters for the first time since July 2005. It was an inauspicious start for the Yankees. After missing a postseason for the first time since 1993, New York spent $423.5 million on free agents Sabathia, A.J. Burnett and Mark Teixeira. At Arlington, Texas, the Rangers’ Kevin Millwood allowed one run over seven innings in his fourth consecutive opening-day start, and the Rangers scored seven runs in five innings off A.L. Cy Young Award winner Cliff Lee. Hank Blalock and Jarrod Saltalamacchia homered for the Rangers, whose 15 hits off four pitchers matched their most in an opener. Lee who allowed only four earned runs in his first seven starts a year ago, then finished 22-3 with an A.L.-leading 2.54 ERA. At Toronto, umpires waved both teams off the field for 9 minutes in the eighth inning after two balls were thrown from the stands in the direction of Tigers left fielder Josh Anderson. Grounds- keepers cleared paper airplanes and empty beer cups from the warning track as the public address announcer read a message warning fans the game could be forfeited. 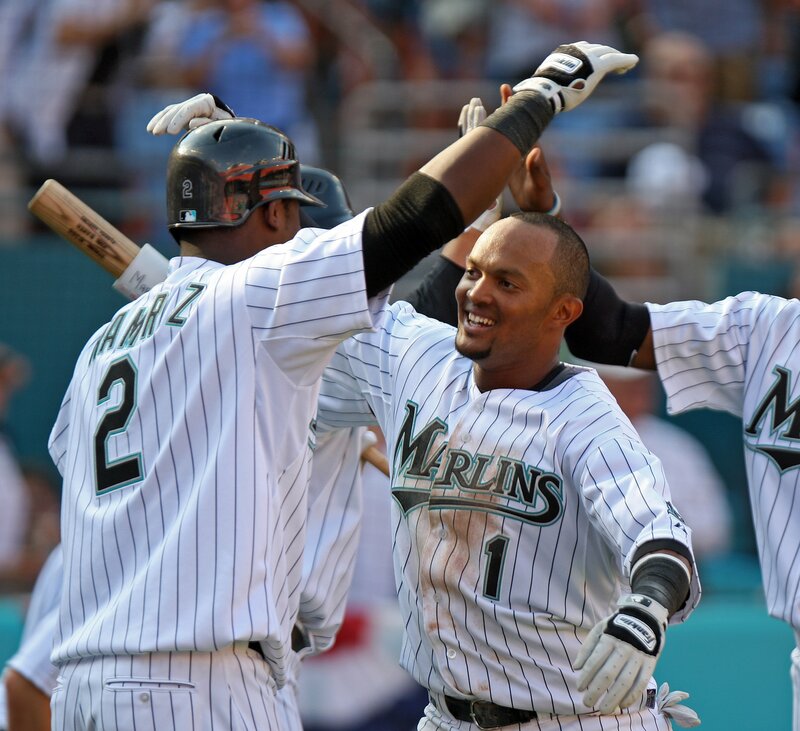 At Miami, Bonifacio went 4-for-5 against his former team, stole three bases and scored all four times he reached. Florida also hit three homers over the fence, including Hanley Ramirez’s grand slam. Bonifacio’s inside-the-park homer was the first on opening day since Boston’s Carl Yastrzemski did it in 1968.